25 of my favourite props for the history classroom! “Fill the Gaps” (“Cloze”) exercises are a very simple but very effective strategy for helping students build up vocabulary and to learn fresh information through focused, methodical reading of a passage. I find them an excellent way of introducing a topic by providing students with an initial ‘information rush’ about a topic before we then start investigating the key issues relating to it in more detail. There are various online tools to help create these sorts of exercises (example) although I have always found it sufficient to simply insert gaps directly into a typed passage in a word-processed document. Don’t provide students with the list of missing words straight away. Instead, challenge students to fill the gaps purely from their own background knowledge. Award extra points for anyone correctly filling in any such gaps in this ‘first round’. 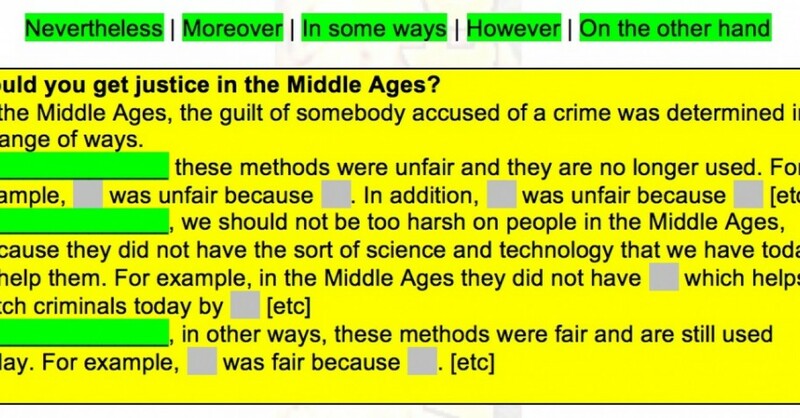 Use familiar key terms from earlier topics: this is a nice way to remind students of earlier vocabulary that they have learned!). Use new key terms that students will learn in the new topic, and then challenge students to research the meaning of each of these as an extension / homework activity. Remove adjectives and adverbs from the account and challenge students to choose to insert the appropriate term either from their own judgement or from a suggested list. This is a particularly good strategy for developing creative writing skills. Remove linking words and phrases (e.g. However, Therefore, Nevertheless, Additionally, Hence) from the start of paragraphs. This is a great way to help students think more carefully about how writers join paragraphs in a logical flow. Remove the occasional piece of punctuation. This is a good way to get students thinking about when it is appropriate to use full stops, commas, semi-colons, hypens and so on. Remove individual letters from commonly mis-spelt words, not just entire words.